A journey is personal; I constantly seek inspiration. 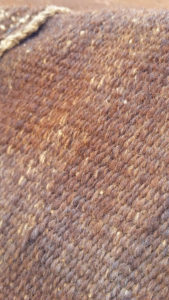 As misterstiltskin a textile artist, I immerse myself in the process, the tactility of the textile. I absorb aspects of a culture to discover the purpose and sensations of creativity. 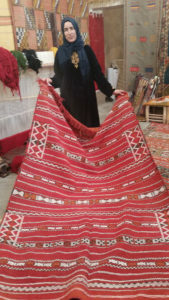 Amazigh Cultural Tours Morocco, led by Rita Lazauskas, offers a textiles tour of Morocco, visiting working artisans and cooperatives that benefit the local communities and explores traditional Amazigh (Berber) crafts at a grassroots level with a focus on the culture and people. I was drawn to the idea of travel with like-minded people. 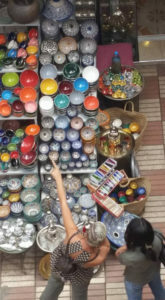 Morocco is a fascinating place of mystery, its rich history of design is present in everyday objects, textiles, architecture, light, and brilliance of color. Combining an insight to the culture of people with the arts instils a real connection and embeds lasting memories. As a textile obsessive, I wanted inspiration. 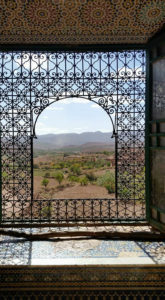 Moroccan marketplaces are laden with rugs and objets d’art, but authenticity is found in the village, the desert, and the home. Taking in visits to architectural landmarks such as Kasba El Glaoui in Telouet, the fortified village (Ksar) of Ait Ben Haddou, magnificent mosaics in the third century Roman and Berber city of Volubilis, the tour began in Marrakech, travelled through Ait Oumghar, the High Atlas Mountains, the beautiful oasis of Skoura, Merzouga in the Sahara, Fes, and Rabat. I was instantly struck by the color and light. The Al Kawatar Association supports disabled women in the design and creation of contemporary clothing and napery, which is hand-detailed with fine embroidery and lacework. Les Jardins Majorelle is a striking azure blue amongst cooling ponds and luxuriant gardens containing the Musée Berbére, which houses intricate Amazigh costumes, jewelry and carpets. 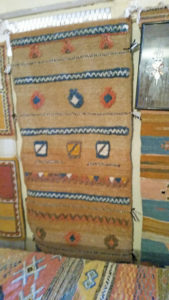 The Tiskiwin Museum, displays Amazigh artifacts, clothing, rugs, tools and decorative objects collected from Marrakech to Timbuktu. The museum details comparisons between tribal cultures across country borders. The dyers souks and weavers in the old Medina. 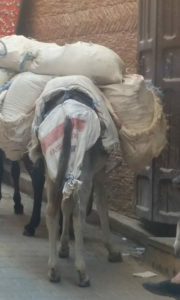 Laden donkey in the dyers souk. 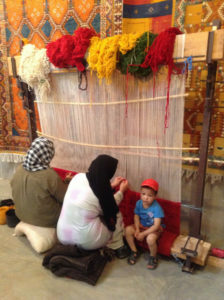 The embroiderers of Ait Oumghar work in a cooperative crocheting fine silk lace trims for linen shirts and bed linen. These projects impressed me with the ways in which local women are empowered, and their craft encouraged. I was touched by the work in Alt Oumghar where women of the ‘Tiwisi’ (‘Collaboration’) Association are taking literacy and numeracy lessons along with the needlework projects that afford them a small income and independence. 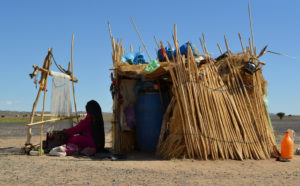 The Sahara Desert has vast landscapes where nomadic families live simply in low tents woven from the coarse hair of camels and goats. 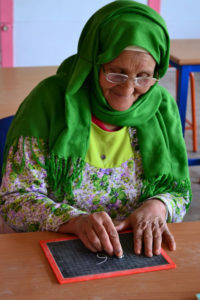 In the small village of Lmdint, in the Anti-Atlas Mountains is the Afous Gafous (Hand in Hand) textile association, local women work together to support their creative activities. 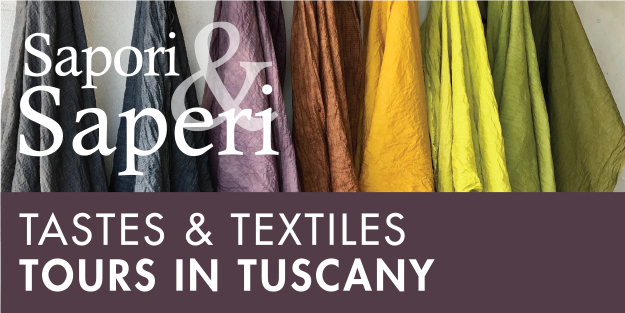 weaving beautiful traditional and modern rugs from handspun wool, dyed with natural dyes in a gorgeous range of colors from locally collected walnut, henna, pomegranate, rose madder, and saffron. 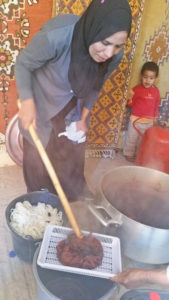 The women cook us a delicious lunch. 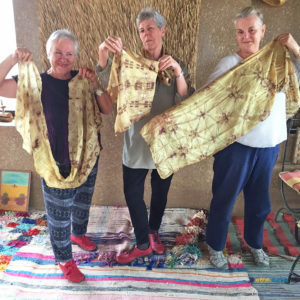 In the centre of the room the association president Zahra and Fadma, one of the most experienced members of the group, prepares a cauldron dye pot using Rose Madder, in which we dye our own shibori-style silk scarves along with handspun wool. 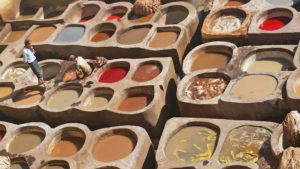 The imagery of the iconic leather tanneries in Fes are worth the olfactory sacrifice. Imdint cooperative natural pomegranate dye. Rita has great connection with the people we met. I could see mutual respect and admiration between her and our hosts at the stunning places we stayed. The people of Morocco are friendly and rightfully proud of their amazing country. The beauty of the country is within. Creation is not a commodity. The melding of utility with aesthetic, evolving over millennia inspires me to pause and appreciate that the value is in the process. In my experience of the performing arts–live theatre, props, and stage management–the process of creating each piece of theatre begins afresh. The text is unraveled and a story stitched together supported by images and tableaux. I follow similar processes in my textile practice. Creating with fibre is profound. Handcrafting empowers, develops self-esteem, new skills, and stimulates the senses with color and texture. My mission is to share my love of textiles and inspire in others experimentation and creativity in fibre arts. I continue to carry memories of the remarkable people of Morocco, the places and creations that inspire me in my own artistic development. – Misterstiltskin is a textile company based in Melbourne, Australia. Thank you for this post. 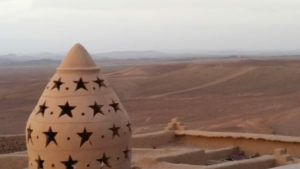 I enjoyed the memories it brought back from similar experiences when I visited Morocco last year. It was such an incredible visual delight. Because of it, I'm still circulating images from the trip in my head, letting them spur on new artworks. I spent weeks painting all sorts of things in my yard (window boxes, terra cotta pots, bird boxes, trellises) the colors in Les Jardins Majorelle.